The living room coffee table I grew up with was round and brown and held magazines, the newspaper and the remote. My mother didn’t allow drinks on it since it was made of wood. When it was time for parties, a doily with a basket of flowers was placed in the center and coasters came out to protect it. I remember doing puzzles on that table and finding Easter eggs hidden under it on Easter morning. The home I live in now has a more formal living room as well as a family room. I’m more careful of the living room coffee table since we entertain in there more and also because it’s a solid wood table we inherited from my mother-in-law who would frown if I wasn’t careful with it. The family room coffee table is solid wood, but it has streaks of crayon where the kids went way outside the lines, nail polish spills that didn’t completely come off, and occasionally some shoe marks since no one is afraid to put their feet up on it. What about your coffee table? Maybe it’s a centerpiece, maybe it’s not. Perhaps you rely on it for storage, or maybe you don’t. Is it a statement piece or do you use it a lot? If you’re looking for a new one, where should you begin? Try to factor in scale when choosing your coffee table. It shouldn’t be more than two-thirds of the total length of your sofa if it is being paired with one. Going with a smaller coffee table is better than getting one that’s too large. 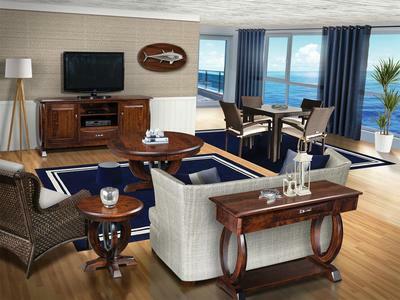 Remember you’ll want room to move comfortably around the coffee table too. A space of 18 inches between coffee table and sofa (or other seating) is ideal. The Arlington Living Room Set. The coffee table is proportionate to the sofa. Coffee tables began as tea tables (where teacups were placed) in Europe during the Victorian Era of the late 18th century. They were tall and round, creating an inviting seating area. It’s debatable exactly when the lower coffee table height and style took over, but coffee table production increased and expanded during the 1920s as the convenience of sitting on the sofa and drinking coffee sought the perfect spot to set down the coffee mug. The coffee table should be the same height as your sofa or one to two inches lower. Standard height for coffee tables is 16 to 18 inches. 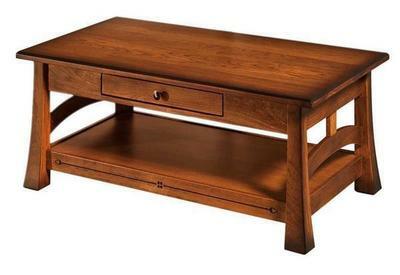 The Amish Brady Large Coffee Table measures 18″ high. Take cues from your seating line up when choosing a coffee table shape. Square coffee tables work well for smaller spaces or smaller seating arrangements. 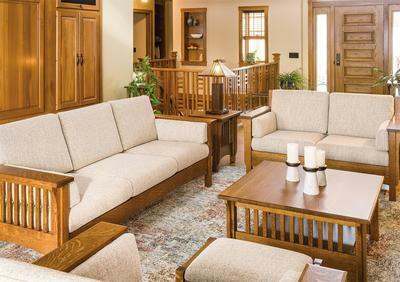 The Pioneer Living Room Set shows off a square coffee table. Rectangular coffee tables are the most popular shape and can handle larger seating like sectionals or sofas. 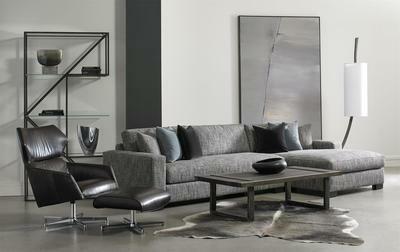 The Connor Sofa Sectional paired with a rectangular coffee table. 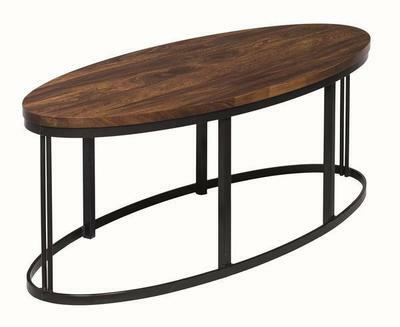 Round coffee tables work well with smaller sofas or loveseats. They can get lost with a long sofa. Living room set featuring the round top Saratoga Coffee Table. 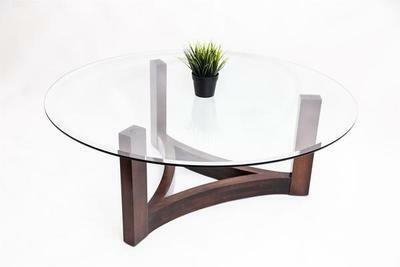 For a more formal sitting area, a glass top coffee table fits in fine. For a casual family room or living room that gets a lot of action, you’ll need a sturdy table. 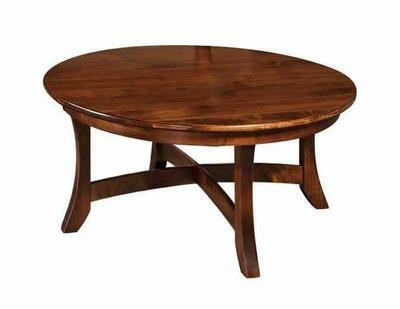 Round coffee tables are a good pick to protect kids from sharp edges when they’re playing. The family room coffee table needs to be made of durable material for all the wear and tear it will receive. If you need your coffee table with storage, there are all kinds that come with shelves and drawers. 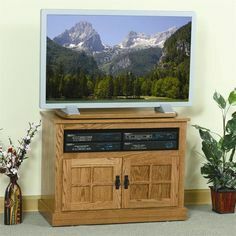 Also a good idea for the family room that calls for a less decorative coffee table. 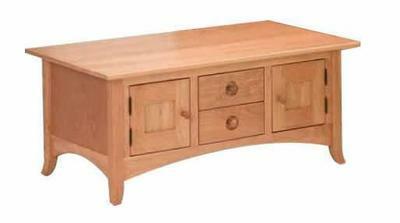 The Amish Geneva Cabinet Coffee Table shown in cherry wood with natural finish. 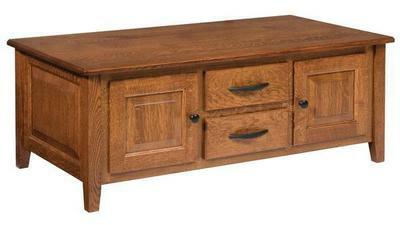 The Amish Austin Coffee Table with 3 storage drawers and cubbies. 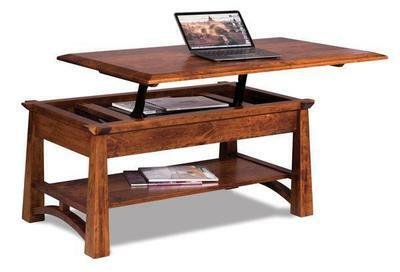 Lift top coffee tables let you raise the surface to make it more comfortable to work or eat from the couch. They make great coffee tables for a small apartment or living room space. Did you purchase your coffee table new or did you inherit one? What are you looking for in a coffee table? What are your coffee table stories? If you had to pick just one coffee table to recommend from DutchCrafters, which one would it be? Thanks for reading Timber to Table and for your question, Ross. This a tough question. We have so many great styles to choose from, and tastes differ, but our American Mission Junior Coffee Table was our best-selling indoor coffee table in 2018. 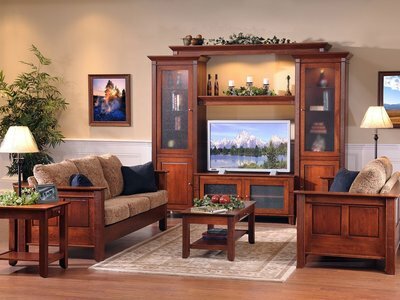 Mission style furniture is always a great option since its clean, functional aesthetic pairs well with a variety of design styles. A mission style accent won’t overtake a room filled with furniture already. We hope this helps. 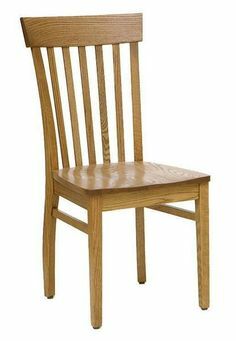 Please don’t hesitate to reach out to one of our knowledgeable furniture specialists at 866-272-6773 or at questions[at]dutchcrafters[dot]com.